9 highlights from the Headroom Show 2017 | What Hi-Fi? 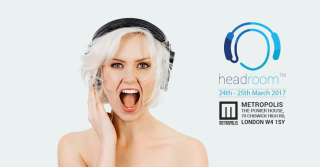 If you're into portable audio, the Headroom Show is a good place to be - headphones, portable music players and pocket-sized headphone amps/DACs are all on display and ready to be auditioned. Those using headphone-based home systems are also catered for with options, to suit a wide range of budgets, hooked up to headphone amps ranging from the perfectly affordable to ultra high-end. The Chord Hugo 2 headphone amp/DAC was officially launched at CES in January and has to be one of the most eagerly anticipated hi-fi sequels of 2017. It's the successor to the five-star, Award-winning Hugo, with differences including a brand-new button layout and trimmed-down chassis. The Headroom Show was the first time we'd seen Cyrus' new micro-DAC in the wild. The British hi-fi manufacturer actually turned to Kickstarter to help fund the soundKey and managed to rustle up nearly £80,000 in backing. It's available in four different finishes (black is the only one not in the photo) and will cost £99 when it officially goes on sale in a couple of months. Even showcased a range of headphones it dubbed "glasses for your ears". Key to each of the headphones, including the upcoming H2 Bluetooth model pictured above, is the built-in calibration software which takes readings for each of the wearer's ears based on responses to various test-tones. The accompanying app then creates a unique 'earprint' which you can store and see online. They're the first to sport fully open-backed, full-range drivers with Beryllium 'M'-shaped domes - a design derived from the company's high-end Utopia loudspeakers. We've just finished our review of this very pair of headphones, so keep your eyes peeled as we reveal all in the coming weeks. There was no shortage of headphone amps on display at the show, but Goldmund's THA 2 offers something slightly different. Besides a wide-band amplifier, digital volume control, high-res audio support and a selection of digital inputs, the THA 2 also features its own binaural processing. Headroom saw Grado's latest over-ear headphones, the GS2000es, make an appearance. These £1600 open-backed cans combine two different wood types (maple and mahogany) to make the enclosures for the purpose-built 50mm drivers. Grado claims the maple "allows the energy of the sound to be transmitted," while mahogany "allows it to open up and reveal the harmonic structure and space that the artist intended." The amp includes four custom-made 300b tubes while the headphones use HiFiMan's Ultra-Thin Driver nanotechnology, which claims "lightning-fast response with virtually zero distortion." A brand new launch, exclusive for Headroom, was the Pioneer XDP-30R. It's a portable high-res audio player that, at £350, comes in under Pioneer's current XDP-100R. The touchscreen-equipped player boasts a 15-hour battery life, expandable memory and hi-res audio support including DSD and 32-bit/192kHz files. There's also an MQA update scheduled for shortly after the player goes on sale on May. It's not every day you get to experience a £54,000 headphone-based hi-fi system, but Sennheiser's Orpheus HE 1 sat proudly on display at the show. And a lucky few were able to have a quick listen.